T: Why did the McCann's need to air their car boot in the still of the night? The Witness Account: "I drive down this street every day to turn my car around at that end and every time that I passed the house and I looked at the car, the car always had an open boot door, day or night. I often passed at night and always verified it. It was a fact, I reported it and that was it". This is the statement made by a lawyer, a very credible eyewitness, who lived in the same street as the McCann's, when they moved to their villa. She was never heard by the PJ, because her deposition was considered not to be relevant. The McCann's relatives soon start to make claims that they had transported meat from the supermarket in July 2007, which had leaked blood in their car boot. 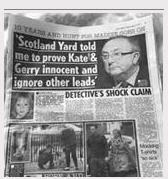 How did the McCann's and their family hear about this witness, when she was never allowed to give her deposition? Rebelo already knew by that stage that body fluids with 15 markers matching to Madeleine, had been found in that same boot. Yet he chose to ignore this woman, I wonder why? Re: T: Why did the McCann's need to air their car boot in the still of the night? Some witnesses are never questioned again in Portugal, like the Smith family, who said they saw Gerald McCann carrying a child in his arms, towards the sea, at around 10 p.m. on the 3rd of May 2007. 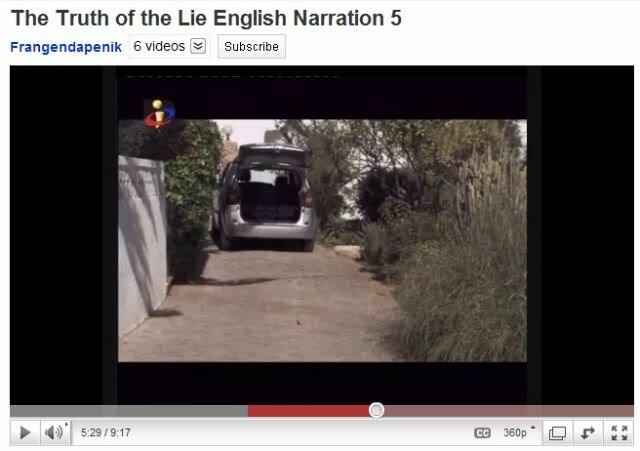 40.04 – The witness who lived near the McCanns’ second home, in Aldeia da Luz, who says she witnessed an uncommon fact about the McCanns’ hire car, where the dogs detected cadaver odour and remains that may belong to Maddie, was not heard, either. This neighbour has signed a document authorising the broadcast of her deposition that identifies her, but fearing threats and pressures, she doesn’t show her face. 40.30 – This is an interesting matter, when I left the Criminal Investigation Department in Portimão, in October 2007, nothing was known about this vehicle, about this issue of the open car boot. We knew that inside the vehicle cadaver odour and bodily fluids had been found, where Madeleine McCann’s DNA profile was extracted from, with 15 alleles. Months later, there is a jurist, who lives nearby, who came to report that after the McCanns arrived at this villa, they saw the car boot open from then on. 41.09 – I drive down this street every day to turn my car around at that end, and every time that I passed the house, and I looked at the car, and the car always had an open boot door, day or night. I often passed at night, and always verified it. It was a fact, I reported it, and that was it. 41.33 – It’s important to report the following: that lady, that jurist, was never heard at the Polícia Judiciária because her deposition was not considered to be relevant, which is strange. While she was not heard, while a rogatory letter was sent to England, relatives of Gerald and Kate McCann came out to say that they had transported, inside this car boot, food from the supermarket, namely a meat package that leaked blood. 42.09 – The great question is how the family heard about the witness, despite the fact that she was not heard by the PJ, and tried to reply to the observed facts. 42.18 – Only a few months later, the investigation is closed. 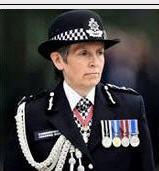 Gonçalo Amaral resigns from the police, writes a book about the case and accepts to return to 5A at the Ocean Club, to demonstrate his conviction that Madeleine McCann died inside this apartment on the 3rd of May 2007. 42.37 – The family’s spokesman accuses him of being an opportunist, who is merely interested in making money. Back in my first few days on 3As, and just before '60 Reasons' was published, I wrote and published on 3As a lengthy article about Michael Wright, titled simply: 'Michael Wright in Praia da Luz'. We looked at a few facts about the hire of the Renault Scenic above. Now we look at the following extract from Michael Wright’s synopsis: “On a number of occasions he [Michael Wright] noticed an unpleasant smell in the vehicle that he put down to the twins used nappies which had been discarded with the general waste. He was not aware of any spillages in the vehicle or anyone cleaning it”. Given these statements, it is more than passing interest that a neighbour of the McCanns observed that ‘the back door of the Renault Scenic was left open all night long’ - presumably to get rid of the smell? It is hardly likely that the McCanns would have left ‘rotting meat’ and ‘dirty nappies’ in the back of the car for long enough for the smell to remain. Smells like that would be washed away with a good clean. The smell of human cadaverine, however, once it attaches to an item, can linger for years. It is interesting that he uses the term ‘unpleasant smell’. As a mature adult, he would surely know what kind of smells resulted from ‘rotting meat’ and ‘dirty nappies’. But he doesn’t say the car smelt of either of these. He talks about an ‘unpleasant smell’ - and one that clearly lingered a long time, being noticed ‘on several occasions’. 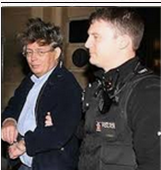 Incidentally though Michael Wright claims that he was not aware of the car ever being cleaned, there is evidence that another relative, Sandy Cameron, was seen cleaning it on several occasions. Clearly it was a most unusual smell. Could it have been the ‘smell of death’ detected by Eddie, the cadaver dog? Quite why dirty nappies should smell that much is a puzzle anyway, assuming that the McCanns do whatever other parents do, namely, fold the nappies up and put them away in a sealable polythene bag ready for disposal. It may reasonably asked why Michael Wright would mention the unpleasant smell at all. There are perhaps two reasons why he did so. Either he never knew that Madeleine’s body may have been transported in the Scenic, i.e. 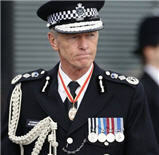 it was all done entirely without his knowledge, and he just honestly volunteered to the Portuguese police that there was a funny smell in the car, or he may have been actively helping the McCanns with the disposal of Madeleine’s body (or known about it and been involved in the subsequent cover-up) by putting up a false reason for the smell in the car - or, shall we say, a reason why Eddie the cadaver dog might ‘alert’ to a smell in that car. One blogger wrote the following about the ‘smell of death’: “For anyone who has never smelt it, the smell of a decaying body can never be mistaken. It cannot and will never be mistaken for anything else. It is a sweet, sickly, gas like smell, nothing remotely like butchered rotting meat or dirty nappies. Anyone who has ever successfully used rodent poison under their floor will (a few days later) have had a taste of what a decaying whole body smells of. Once smelt, never forgotten”. One suggestion made is that Dr Gerry McCann and Michael Wright may have deliberately placed dirty nappies and rotten meat in the car to modify and cover the cadaver scent. Another possibility is simply that during the voluntary questioning of him, the British detective asked him if he noticed an unpleasant smell, agreed that he had done, and simply did his best by putting forward an explanation as to what might have been the cause of the bad smell. The explanation for so many trips to the rubbish dump centred around garden waste. But as we saw above, the idea that the McCanns were able to find time for gardening seems unlikely, as of course was the necessity for Dr Kate McCann to wash the holiday curtains. What other holidaymakers need to wash their holiday curtains? On 22 August Michael Wright flew out again to Praia da Luz, this time apparently to replace the Cameron family who had been helping Dr Gerry and Dr Kate McCann before then. He stayed until 1 September, when amongst other things he booked a large removal firm in Lagos for the McCanns, apparently using his own name. Michael Wright, according to his statement, says he arranged the removal before 1 September. That raises a very important issue. The McCanns maintained that they did not decide to return to England until they were both made ‘arguidos’ on 7th September. Why, then, had Michael Wright already ordered the removal van some two weeks before, at the end of August? 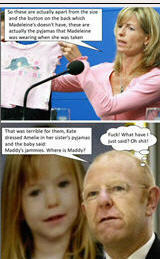 It just occurred to me that do we know for certain that the McCann twins were still in nappies? The nappies are one of the explanations put forward for the smell in the boot, which required the boot to be left open overnight. they were two years and three months old when their sister vanished. Now the age at which children are potty/toilet trained varies. Some parents push potty training to speed up the end of nappies which are expensive, particularly when you have twins. Other parents are more laidback about it letting the child decide when to give up nappies. Now the McCanns seem very money minded. They would not pay the Mark warner evening babysitting service charges -though Kate has said their non use of the service was 'not about money'. So could she have encouraged the twins potty training and they were not in nappies at that time? Sorry everyone, this section is for reference only and all debates should be held in the New Guest Section of the forum.